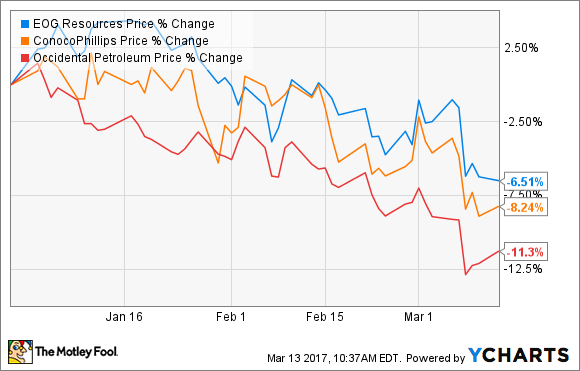 With oil dipping below $50 a barrel, these high-quality oil stocks have gone on sale. After steadily rising for nearly a year, crude prices crashed last week, ending down more than 9% and closing below $50 a barrel for the first time since November. Fueling the sell-off were rising oil stockpiles, which set a record last week despite falling global supplies as a result of underinvestment and OPEC's output curbs. One of the culprits driving up inventories were weak gasoline demand and rising shale production in the U.S. This sell-off, however, looks like a buying opportunity for long-term investors. That's because these oil stocks can do just fine at lower oil prices thanks to their low costs and solid balance sheets. Here's why I'd consider buying any one of these oil stocks right now. EOG Resources recently put the wraps on an exceptional year. The company's oil production exceeded the high end of its guidance range thanks to a significant improvement in well productivity. Meanwhile, costs plummeted, with lease and well expenses falling 20%. The company also completed one of the best acquisitions of the year, adding thousands of high-return drilling locations to its inventory. Overall, it now controls 6,000 premium drilling locations, which are wells that can generate a 30% after-tax rate of return at flat $40 oil. That's enough to last a decade. Because of its improvements during the downturn, it now has a clear vision to become a leader in delivering returns-driven growth. To get the ball rolling, EOG Resources expects to deliver 18% oil production growth this year while living within cash flow at $50 oil. However, it has the flexibility to scale output up or down to respond to changes in oil prices. That said, the general trend is toward delivering high-return growth at lower oil prices, which should fuel significant returns to investors over the long term, even if oil prices remain muted. Like EOG Resources, ConocoPhillips spent the downturn transitioning into a low-cost producer. It pushed down operating and drilling costs and strengthened its balance sheet by jettisoning non-core assets, which combined to refocus the company on a vision to grow shareholder returns. Because of that, ConocoPhillips's aim is to deliver double-digit total returns to shareholders on an annual basis. ConocoPhillips has developed a simple formula to meet this goal, which it believes will grow shareholder returns in any oil price environment. The foundation is a plan to fund at least enough capex to keep production flat, grow the dividend on an annual basis, and protect its A-rated balance sheet, which it can comfortably do at $50 oil. Meanwhile, as cash flow increases, the company plans to allocate that excess toward share repurchases and prudent growth. That said, for 2017 it intends to accelerate its strategy by selling $5 billion to $7 billion of non-core natural gas assets, using the cash to reduce debt and repurchase roughly 5% of its stock. Those value-maximizing asset sales could prove to be a catalyst to drive the stock higher even if crude prices remain low. Occidental Petroleum is slightly different from EOG and ConocoPhillips in that it not only controls a growing oil and gas production business, but it also owns several assets down the value chain in the chemicals and midstream segments. Its most recent investments in those industries are expected to start paying off this year due to the completion of a natural gas project in the Middle East, a chemical plant in the Gulf Coast, and new midstream assets in Texas. These projects should provide an additional $1 billion in annual free cash flow starting this year. That gives Occidental Petroleum more money to invest in its promising Permian Basin position, which it believes can fuel 20% compound annual production growth at $50 oil. That growth would lift companywide output by 5% to 8% per year, which is a very healthy growth rate for a company of its size. More importantly, this is high-return growth, which should drive earnings up even if crude prices don't budge. These three companies all have one thing in common: They can thrive at lower oil prices because they each control a low-cost, high-return resource base. Because of that, these companies can deliver robust growth this year even if oil continues to fall. That ability to thrive at lower prices is why I'd have no problem buying any one of those oil stocks for the long term, even though uncertainty surrounding the price of oil is growing.